First, the bad part of this entry: My wife's Samsung Blackjack cellphone sux! Now the reason: Her stupid phone is supposed to have 64mb of internal memory. The crappy thing always says "low memory" or "not enough memory." Ah, what? I've erased everything I can find on the thing; extra programs, photos, even temporary internet files, and nothing seems to work. And now the transition (both the good and the bad part): I saw a 2009 Dodge Challenger on highway 65 today, proof if which would have been in the photo we tried to take except that @#%* phone said, "not enough memory." Okay the rest of the good part: That car is awesome in person. The driver of this black one saw me checking it out and was nice enough to speed up and slow down to give me extra looks. Then he opened her up (stomped on the gas) and flew past me so I could enjoy the sound of her engine. It truly is an amazing looking and sounding car. 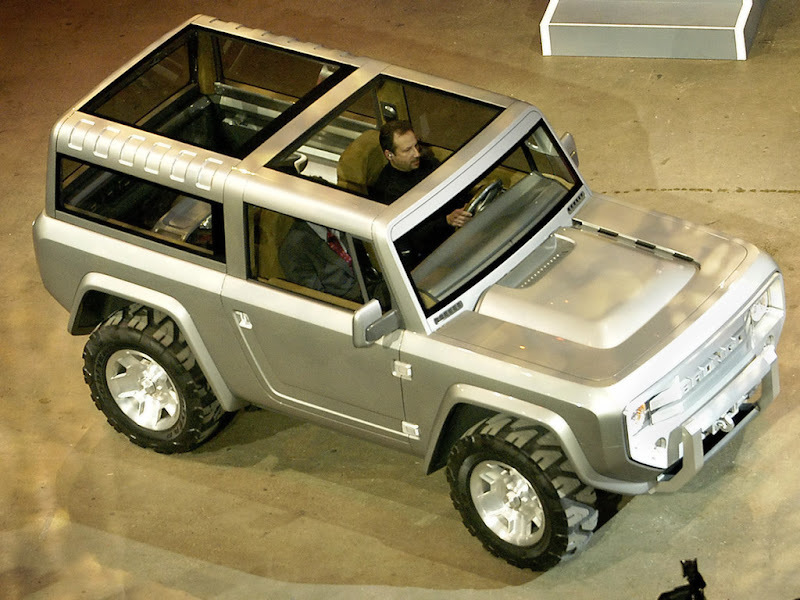 This is the type of vehicle that should be built to save a car company. If Chrysler marketed and priced right more vehicles like the retro looking Challenger, they could pull out of the Chapter 11 road they are headed down. 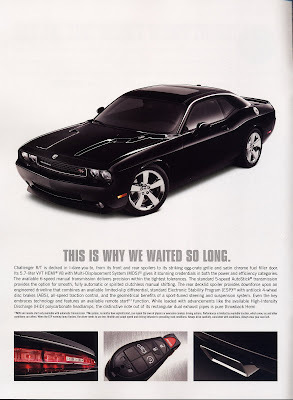 Anyway, great job Chrysler/Dodge on the 2009 Challenger. Today is Sunday, and here I am sitting at home with no plans of going to church. Why don't I have any plans for a Sunday? Frankly, I'm tired of churches and what they've become. All the churches I've gone to recently seem to be about the religion of church instead of the encouragement of the saints. It's not for the edification and preparation of believers. It's not a place where believers go and are encouraged and trained in how to live lives that glorify God. Some places don't even seem to use the Bible. As far back as I can remember, my family has always been involved in one capacity or another in the church. Whether it was helping with music, teaching, or leadership, we've all been participants in our churches. But church really didn't seem like religion to me until a few years ago. I realized I was starting to go because I was "supposed to go". I would play the piano or the drums but not really be involved to glorify God. Participation became more about the use of my talents than about my own spiritual growth. There hasn't been a good sermon, a solid leader, a mature group of believers in my life for a some time now. In fact, I can't remember being challenged by a fellow believer in probably 8 years. Why is that? What is wrong with the church today? Why is it that God allows so many churches to "pop" up, claiming allegiance to Him as "Christians churches", but so often not even knowing Him or His Word? Why are places like these "seeker friendly" churches so prevalent in our society? How can so many people be okay with mediocrity? Others teach a themes that allow for sin or weakness or failure in our lives. Grace is taught as the forgiveness of sins to the point where "Christian liberty" is turned into freedom to sin and freedom to fit in with the world. This is unacceptable. Church today is leading people into a false sense of security. "If I go to church and feel good about the message, I'll be fine on judgment day." NO YOU WON'T! The relationship with God is not there. The truth and the true understanding of God is not there. There is a complete lack of the realization of what God DEMANDS from our lives. We can't live day to day in sin and think we are going to be okay because we are church going people who "believe" in God. If you don't know Him you can't believe in Him. And grace covers a multitude of sin, yes; but a life of sin is not a life that is lived with an understanding of who God is and what He demands, what His wrath will destroy. Our sin has eliminated our access to Heaven. Salvation provides the only access for us after that. Salvation takes faith in God. Faith in God requires a knowledge of the true God. Without knowing God, we have no hope. The Bible needs to be the center teaching point in a church. But not just part of the Word of God, all of it. Not just the love of God, but the wrath too. And I'm really writing this blog entry out of frustration. The frustration I have is over the wide selection of places and the lack of selection. What I mean is, there are a lot of churches out there that don't teach God's Word correctly, if at all. Today, the realization of my own needs has come to a head. I, for the first time in 32 years, realized I don't have a church body or a prospective church body or a place I can even go to corporately worship God. HOW HORRIBLE IS THIS!? Instead of too many places to chose from, I'm faces with too many places not to chose. For now, I continue to listen to Piper and other great teachers online. I am going to begin to pray for a church that is led first by men who desire to know the truth of God, who study all week to bring together a clear and complete picture of who God is and how He requires us to please Him. I'm going to continue to study diligently on my own, to better understand my God through His word. I'm going to continue to write my thoughts to allow others to add input and correction and encouragement to me and my walk. But I'm going to pray today that God will be glorified through the correction of the path of His church here in my county and then in my country and then in the world; that He will be taught better and more accurately, that true salvation will be realized by the so called "Christians" of the world. I am going to pray that God reveals His true self to us. May God be glorified in all things. May He be praised through my life, that I turn each day over to Him for strength, boldness, wisdom, faithfulness, kindness, love, truth, and righteousness. May He grant me understanding beyond my own abilities, that I may witness to the unbelievers and the unsaved and the confused misled masses. May God give me a wisdom that only He can provide, and a knowledge only His Word can bring. And may His church be matured by the teaching of His Word and the faithfulness to the truth of the whole of scripture. This is awesome. 3104 Clan Buddies and fellow Simpsons fans and Quake 3 fans unite. Paul explained in Ephesians 3:9-13 that God sent Christ to be the payment for our sins, both Jews and Gentiles. He brought to light the fact that it was God's plan hidden for ages. Not just Jews, but Gentiles who had faith were also saved. And through the church "the manifold wisdom of God might be made known to the rulers and authorities in the heavenly places." Since this is the eternal purpose of God realized in Christ Jesus, we have confidence through our faith in Him. This was a hard passage to understand and explain. But so far chapter 3 has been about the revelation of the mystery of the gospel. Paul basically explains that the salvation that comes from Christ's death on the cross revealed that the plan of salvation is for all who have faith. Prior to that, Jews believed this salvation was going to be for them only. Ultimately they rejected Christ as their Savior and His death on the cross paid for the sins of all who believe. Of course all is done for God's glory, not ours. And salvation is another way His glory is revealed. Usually, Caleb wakes us up around 6:30am and I get a start on my day. Yesterday and today my actual alarm clock has been waking me up at 7:00am. This means I don't have the time to write about what I've read. Ephesians 3:1-6 starts with Paul reminding the readers that he is in prison for his preaching and for sharing the gospel. That is awesome faith. I don't think there are people like that today. I think their are going to be more people that sit before God and hear the worst thing that could ever be said by God. "Depart from Me, I never knew you." Fortunately, Paul also taught that the promise of salvation is for both Jews and Gentiles. The mystery of Christ was revealed through Paul that Gentiles are "fellow heirs, members of the same body, and partakers of the promise in Christ Jesus through the gospel." Yesterday I received a text message from my wife about dinner. She said she couldn't think of anything to make. I suggested CHILI's. When I got home she told me she thought we should try something different. 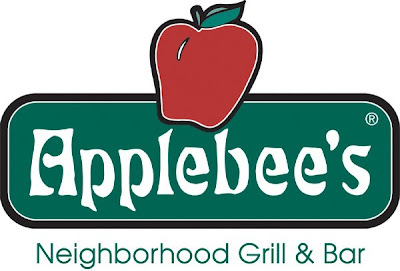 She suggested Applebee's (Eatin' "Good" in the Neighborhood). More than 5 years ago I went to an Applebee's in Rocklin. It was awful. The garlic mashed potatoes tasted like they were made with dirty dish water, the meat was tough, the service was slow, and I said I was done with Applebee's. Then a few years ago, Lincoln got a new Applebee's. We tried it out, as it was the only restaurant of its kind in Lincoln at the time. Again, the service was terrible, the order was wrong, and the food was not good. And, again, I said, "I'm done with Applebee's." This brings us back to yesterday. My wife and I, along with my son, decided to "try something different." At our first step into the door of Applebee's I should have known this was not going to be good. There was no host. We waited to be addressed by an Applebee's employee for about 3 minutes. There was no one coming. Finally a man came up, I believed him to be the manager. He asked us if we wanted to be seated. Ah, duh. At that time a female host came and we were finally seated. Then our server. Goodness she had some issues. Overly fake and I could tell she was not the type who pays attention to the customers needs and ends up blaming everyone whe works with. She stated with the usual, drink orders first. Then we waited...and waited. She came back to take our order. "Oh you don't have your drinks yet? My assistants are slaking tonight." She left to get our waters. Now with the water, we order. And then we waited...and waited. Finally the food came. "Sorry the kitchen is backed up." It turned out my meal was pretty good. I got a "Trio" with Mozzarella sticks, Buffalo Wings in a Teriyaki Sauce, and 2 slider Bacon burgers. My wife's meal on the other hand, was awful. She got the Fiesta Lime Chicken. (8+ years ago I got this in Auburn and it was good. Of course, it was called Tequila Line Chicken then.) The Chicken was dry, the flavor was absent, the tortilla strips were stale, and the rice was just gross. What seemed like hours later, we finally got our bill and left. AGAIN, I said, "I'll never go back to Applebee's. Now let's talk about something positive. Chili's. Everything about Chili's is great. Start with a nice glass of mango iced tea and some chips and salsa. Chips that are better then Chevy's Fresh Mex chips, and are around $3 compared to $7 if you get them to go. Then you can order your meal. Chicken Club Tacos, Monterey Chicken, the Old Timer Burger, soups and salads, or even the Guiltless Grill items are all good meals. The service is fast, the employees greet you at the door with a smile, the smile continues through the whole experience, the prices are good, everything about Chili's is awesome. Those of you wanting me to move back to Auburn, get a Chili's and we'll talk. Applebee's is ridiculous. http://view.break.com/521743 - Watch more free videos Sweet. We are part of the household of God, and every house needs a foundation. Ephesians 2:20-22 paints a picture of our role. God's household is built on the foundation of the apostles and prophets with Christ Jesus as the cornerstone. On this solid foundation we are joined together to build a holy temple in the Lord, a dwelling place for God. This is an awesome picture of the glory of God being praised through His created followers. God created us, saved us, and made us into a temple for Himself. We will ultimately glorify Him together with the apostles and prophets as one complete household designed only to praise, worship, honor, adore, and magnify the God, the One who called us before the foundation of the world. Our God is an awesome God, worthy of all praise, worthy of all glory. He saved us from sin and eternal death, to be built into a holy temple of worship to Him, where He can dwell in His glory. I learned a little more about the symbolism in verse 14 of Ephesians 2. In the time Paul wrote this passage, the Temple had a wall dividing were the Gentiles and the Jews were allowed to go. Jesus effectively broke down this wall by dying for both Jews and Gentiles. He "made us both one...(15)by abolishing the law of commandments and ordinances, that he might create in Himself one new man in place of the two." Through the death and resurrection of Christ we are saved alike or both reconciled to God, "(16)thereby killing the hostility." There was a lot of hostility between Jews and Gentiles. But God put an end to that through His Son. Ephesians 1:8-9 are probably 2 of the most familiar verses of Ephesians. And to read them this morning, with all the studying of Ephesians I've done to this point, it's almost a no brainer. It's more of a recap of everything up to this point. But it is a clear set of verses to remind us we are saved by grace, not by anything we did. Really, I take comfort in that. If it was up to something I did or had to do, I'm afraid I'd fail. Actually I know I'd fail (no power of death). God's grace saves us. Salvation is a gift from Him. And, in case you are doubting the fact that you had no part in your salvation, these verses make it clear. "And this is not your own doing...not a result of works, so that no one may boast." You didn't do anything to gain your salvation. Verse 10 goes on to tell us that "we are His workmanship, created in Christ Jesus for His good works." We are to walk in these good works. So, those of you who are thinking there is something you have to do, you are right. You can't do anything to earn your salvation, but once saved we must walk in His good works. These good works God created beforehand for us to walk in them. We better be recognizing the opportunities to glorify Him with them. Once saved by grace, we are to do what God designed us and saved us to do. Glorify Him. 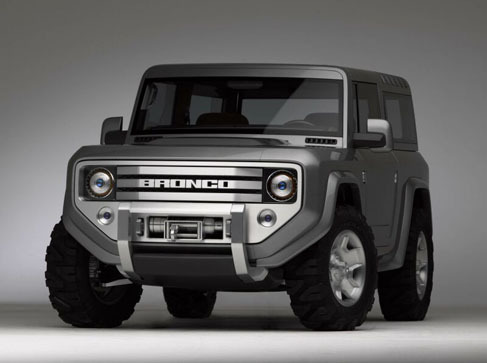 The Bronco II was probably the worst vehicle purchase I've ever made. 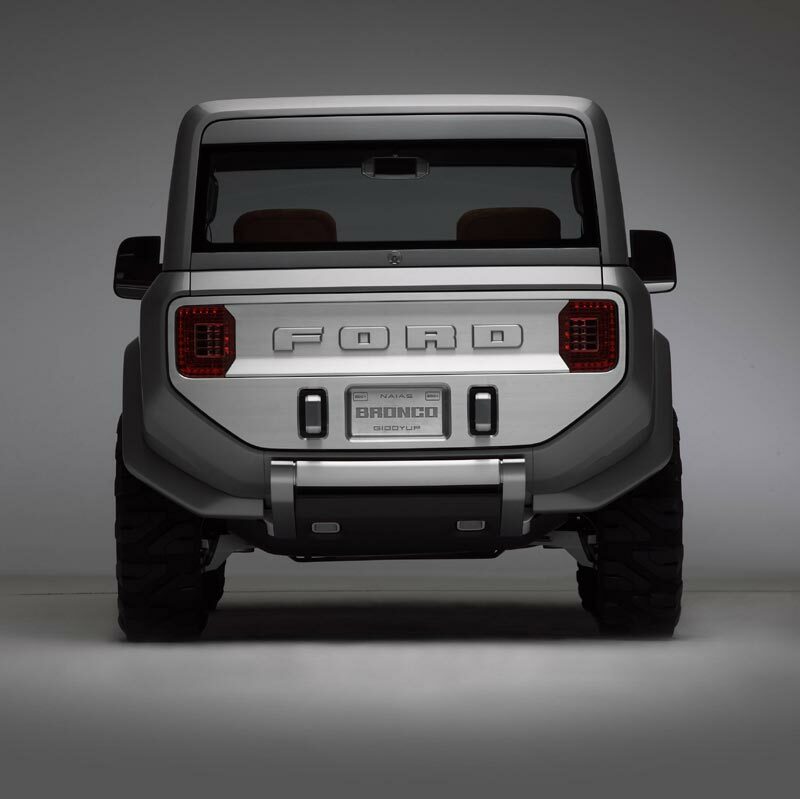 It was my first Ford product, made back in the REALLY REALLY bad Ford quality days. The Bronco II was not built for my type of driving either. It was tall and had a tendency to want to roll over. Once I had a car full of kids and I attempted a J-Turn (I'm an idiot) and almost rolled it in front of Taco Tree. So I pretty much hated that car. It was a horrible vehicle. I took it 4 wheeling and almost rolled it, blew out tires, and slid sideways into an embankment. I eventually sold it. No less than a month after selling it, I saw the girl who bought it broken down on the side of the road. I saw her at my job a few weeks later and she told me it was falling apart on her. Yeah, it was a Ford. I was lucky to get out of it when I had the chance. I think I remember her telling me something about the head gasket. The problem with this concept is how long ago it was introduced, 2004. It's probably not going to make an appearance as a production car. DANG IT!!! Put a V6 in it and give it a decent MPG and it will sell. It's better than that Flex thing they are introducing now. I've known Ted for more than 13 years. We worked at Round Table Pizza together, made our own home movies with friends (like "The Right Side", "Mad Man Jim", Etc. ), and watched every movie ever made. He is a member of the 3104 Clan and a good gaming partner. He's been a good friend for a long time. I think one of the greatest things about Ted is his ability to fit in with any group of people. Everyone who meets him like him. My parents liked him when I used to hang out with him all the time, and they still like him today. My wife likes him and says she thinks he is one of the nicest friends I have. She likes to talk about how he will clear his dishes after dinner and even rinse them and put them in the dishwasher. I've introduced Ted to other friends of mine too, who now ask if he can come over when we have parties at my house or theirs. People love Ted. I've been blessed with his friendship and enjoy our long history as friends. Although marriage and having a family take away a lot of the free time I used to spend with Ted, we are still able to pick up right where we left off every time we do hang out. There is not a better friend on the planet. So happy birthday Ted. I hope you have a great one. I really just felt like writing about my car. Why? Because I recently set my laptop's desktop picture to a picture of the VW R32, and I love both my car and the R32. Let's start back at the beginning of my driving experience. 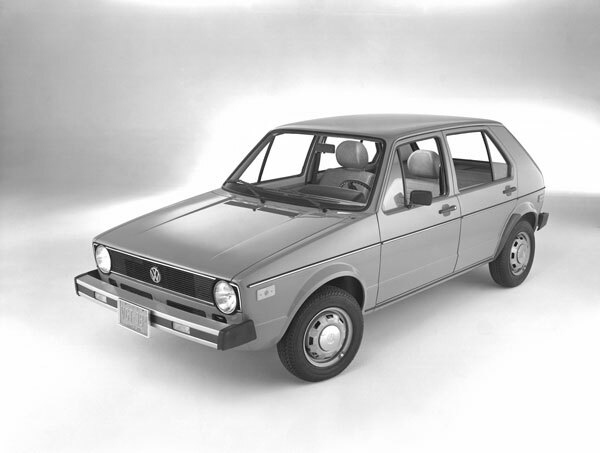 I've written about getting my license on the day of my 16th birthday and driving a 1976 diesel Rabbit before. I was super excited to be a driver. The diesel engine in that Rabbit got upwards of 40MPG. This is a picture of what it looked like, but not my actual car. Later I bought my first new car, my current 1999 VW Golf. It won out over the 1999 Civic Si in both driving and handling and in comfort and design. The glowing blue instrument panel with red highlights looked awesome. And my Golf averages around 28MPG. 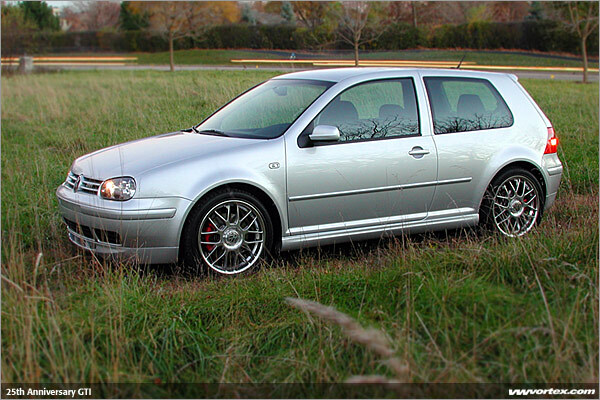 Here is a picture of my Golf and then the 2001 25th anniversary Golf. My wife and I are soon going to be purchasing a new car, provided my new job supplies the funds. Although the Golf is not the family car of choice, I love the way the VW Golf (Rabbit, GTI, R32) handles. The control on the road is predictable and smooth. You feel one with the road. Each turn and challenge of the roads where I live are exciting to drive in a Golf. You can feel the vehicle react to the road without feeling like the ride is bumpy and rough. The R32 is a Golf on sports steroids. It's a 2 door model with a V6 (VR6) engine. It's more powerful and has a sports suspension that increases the cars sporty handling abilities. I know this is a boring post but the pictures of this car are awesome. And I love it. If I get a family car for my wife, I may someday buy I new Golf for the MPG and the fun for me. We'll see. BEFORE YOU WATCH THIS, I WANT TO WARN SOME OF YOU WHO ARE OFFENDED BY BAD LANGUAGE OF ONE CUSS WORD AT THE END OF THIS VIDEO. Also, this is a video to show you that guns are dangerous and powerful. Know how to use one before you ever think about firing one. I used to go to Great America 2 times a year or more. My church youth group used to go all the time. It's been a long time since then, 15 years. If you didn't read yesterday's post "Who We Were", read that first then come back and read "Who We Are." Not that I think I'm such an accomplished writer, I just want you to catch the theme of this text. We were dead in sin "BUT" Ephesians 2:4-7 starts to show us God's rich mercy and great love which made us "alive together in Christ." By grace we are saved. This is an amazing thought. Again, we are shown God's power over death. We were dead in our trespasses and sin. We are alive because of God's mercy and love. Well all of that is amazing, but there's even more to our resurrection. God raised us up with Christ and seated us with Him in the heavenly places. Wow! Not only did he save us from our sins but He rewards us with a seat in heaven with Him. What a great God, merciful and loving, nothing I deserve; I was dead in my sins. I don't have power over death, only God does. He called me out of death by His mercy, by His love. Now, why would he do this? I've heard of some people believing it's because we chose to believe. And since God promised to save us if we believed, our choice saved us and gave us this gift. While some of that may sound true and accurate, this puts the power over death in our hands. And that's not the case. No human has power over death. (I'm sure some doctors would like to think they do. They don't.) Here it is in this passage. The second word is "GOD." Re-read the passage. It's God who saves us. God made us alive. By HIS grace we are saved. Back to my "why" question. Because, verse 7 tells us, "in the coming ages He might show the immeasurable riches of His grace in kindness toward us in Christ Jesus." It's done by Him to glorify Himself. If we made the choice, would he deserve all the glory? No, we would think we gained life from our decision. We didn't. We couldn't. Sins hold on us is as strong as death. Once you're dead, that's it. Unless you have that required power over death. You and I don't. God does. God saved us from sin. God made us alive. God be glorified for our resurrection from the death we all faced because of our trespasses and sin. It is only by His mercy and love that we are saved. Praise God for His Rich Mercy and Great Love. Driving home from work tonight, I heard a new Southwest Airlines commercial. They were talking about how you can switch your flights without a fee for doing so. At the end of the commercial I heard, "Please don't fly with us." Of course I quickly figured out it had to be "Fees don't fly with us," as that was the topic of the commercial and it seems to be a catchy little saying. The problem is most people, like me, don't really pay any attention to commercials. And if you are not listening very closely, it can sound like Southwest doesn't want you to fly with them. Let's see how long this ad lasts. I think it may get pulled quicker than some. Although, they did get me to post about it, which is free advertisement for them. So often I think about my sin and how frustrating it is that I keep sinning, that I continue to do things that God does not approve of. If you read my post about losing my job with PCSO, you'll see I believe God was trying to get my attention with that. My sin nature stopped me from being a light in that dark place. But I know that my sin is wrong, the Spirit prompts me when I participate in it. Ephesians 2:1-3 talks about "who we were" before God's saving grace. We weren't just sinning, we were dead because of it. "And you were dead in the trespasses and sins in which you once walked..." This is the course of the world, following Satan. Instead of seeking the things of God we followed the passions of our flesh, the desires of our body and mind. Gross. We were lustful, disgusting, selfish people without God. And Satan, "the prince of the power of the air, the spirit that is now at work in the sons of disobedience", works hard to draw us into sin. Caleb sin separates him for eternal life with God; he is dead in his sin. His only hope is the grace of God through saving faith that Christ died and was resurrected as payment for his sins. As a father, I pray for Caleb's soul, and I long for him to know God as I do. I hope he is able to glorify God better with his life than I do with mine. God's calling in Caleb's life is his only hope for life outside the grip of Satan and sin. Repair Pal is a beta website that allows you to put in your car make/model/year and choose from a list of repairs to get an estimate of what the repairs should cost you. I checked out the estimated cost to get my A/C repaired in the Golf, and the range was near what I was told by George's Friendly Auto in Lincoln. The problem with my results was the size of the range, $679-$1281. The price I was given was near $1200, so I'm at the high end of that large range. Yesterday and today's entries should really be one. I was in a hurry, since I started my new job and I'm still trying to get a new schedule down. Today's will be pretty short too, as I need to get to work soon. Ephesians 1:22-23 talks about where God placed Jesus after He raised Him from the dead. Remember, "For our sake He made Him to be sin who knew no sin, so that in Him we might become the righteousness of God." (2 Cor 5:21) Jesus was made sin, killed, and raised again from death, all by the power of God's great might. And now God "put all things under His feet and gave Him as head over all things to the church, which is His body, the fullness of Him who fills all in all." God places Jesus over all things, feet being the lowest and thought of as a pretty dirty and gross place on the body. But even though He is head over all things, he is given to the church to fill all in all. Every void in every person can be filled by Christ. We, the believers, are the church. We are given Christ as salvation, as the head, the fullness of God to fill the void in our life. God knew we would not choose him over sin unless He called us, GAVE us Christ. So he sent Jesus to earth to live the perfect sinless life, only to then die on the cross as sin for us, the called. After death on the cross, Christ was raised from the dead and placed where everything was under His feet and He was given to the believers as salvation. Wow! What saving grace. Saved by Christ, who is above us. Not "up in the sky" above us, but we are "under His feet" as though we are lowly people bowing before a king. This king, saved us. This king dead for us. This king was given to us as salvation, as the fullness of God who fills all in all. Ephesians 1:20-21 is a the continuation of the previous verse (19). It's a description of just how great God's might is. God sent Christ to die for the sins of man, and then, the great might part...He raised Christ from the dead and seated Him at His right hand in the heavenly places, far above all rule and authority and power and dominion, and above ever name that is named, not only in this age buy also in the on to come." God raised Christ from the dead. A dead man, alive again by His power. That can not be done by humans. We don't have power over death. God does. And not only that, He seated Christ at His right hand, over everything, forever. Praise God for His Great Might. I wasn't going to write an entry on the announced iPhone 3G (or iPhone 2), but after reading Ted's blog about his disappointment with it, I had to comment. Ted made some really valid points. The version 2 should have had some fixes that people wanted. I guess it does have 3G and GPS, but it is the exact same phone beyond that. The rest is software upgrades that version 1 will get too. The things listed by Ted as missing items are a great list of what should have been done. "An iPhone 2.0 with 16-32GB, video camera, cut and paste, 5.0 megapixel camera" are the things that should have been added, according to Ted. I think MMS would be nice too. What Apple could have done is have 2 models. The iPhone 3G and the iPhone 3G Pro. The pro could cost the same as the original iPhone did ($399 &$499), and have the missing features. The "regular" could be what they announced yesterday. 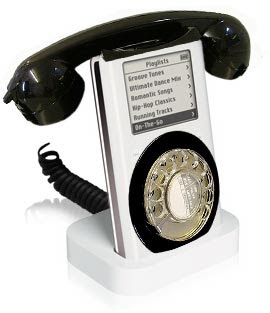 But, like Ted also mentioned, people like me who do not have an iPhone are going to be getting one of these. It's now affordable, and it's still the best phone BY FAR in the world. I think Apple gained sales from people like me, but they lost sales from people like Ted. First edition users are not all going to be as likely to buy the new one with the small amount of updates. So "yippie" for me, but "booo" for Ted and Apple. Ephesians 1:19 ends with the line "according to the working of His great might." This is after Paul tells the saints at Ephesus he prays for them without ceasing and then tells them how he prays. I read this phrase a few times and didn't really understand what it was referring to. What was "according to the working of His great might,"? These really long sentences, which I believe Paul should be famous for, are sometimes hard to follow for me. Verse 16-23 is all one sentence. But that's what's great about doing a study of scripture where you don't limit the minimum length of a passage you look at. That was a lot of setup to say, I finally realized this phrase was connected directly to the previous word. I was too busy looking for a connection to a phrase or the whole prayer that I missed seeing the word "believe". And, so often, we associate the word "believe" with something we do/did. We didn't do it. Our belief comes from "the working of God's great might." To pull a sinner out of sin, it took God's great might. It took God to save us from our sin. He caused us to believe. Because without Him, we wouldn't have chosen Him. We would choose the easy path, sin. We are so blessed, we who are called, by that calling from Him who called us, according to His will, according to His might. My dad recently cut a finger off with a table saw. After all his years of experience, it finally happened. Now there's a company that designed a saw to save your finger. Sure you damage your blade, and the brake cartridge costs you $70 bucks, but you'll still have your fingers. Sorry you didn't have this table saw Dad. Check out more at SawStop's website here. Found on GeekBrief Podcast #369. This Prayer Hour guy is a fool. I didn't realize this when I posted the video. I really just posted it for the Busey stuff. The other guy in the video really does do a show where he acts like a pastor, all the while mocking God. Yikes. Sorry for anyone who feels this video is inappropriate. I have no affiliation with this fool. 3 words people. "METH IS BAD!" Last time he was "normal" was in Point Break. That's a good movie. So, here's another moment with Busey. He is actually the "normal" one in this video. Don't give your money away. I remember hearing that Gary claimed to be a Christian, and if he is, that's great. I have my concerns, but I'm not God and I can't judge the heart. In an unrelated moment, Drugs Are Bad. 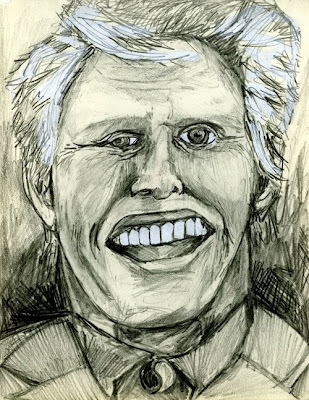 Check out the hourly Gary Busey Day moments over at Tech-Guy-Ted. To break it down even more for myself, Paul prayed for wisdom and revealing knowledge. I remember thinking that song, "Open the Eyes of my Heart, Lord" was goofy. Eyes of my heart? But right here in scripture Paul uses that phrase, "Having the eyes of their hearts enlightened." Paul prayed that the believers at Ephesus would understand God, the hope of His calling, the riches of His glorious inheritance, and the immeasurable greatness of His power. I pray that the God and Father of our Lord Jesus Christ may give your wisdom and knowledge to enlighten you in understanding the hope of His calling, the riches of His glorious inheritance, and the immeasurable greatness of his power. Praise God for His Wisdom and Knowledge. Paul starts verse 15 of Ephesians 1 with a reference back to all he stated before. "For this reason," or because of the saints in Ephesus, the called ones who are God's children, and because of their "faith in the Lord Jesus and (their) love towards all the saints", he goes on to say in 16 "(he) does not cease to give thanks for (them), remembering (them) in (his) prayers." Paul is thankful for the faith of his fellow believers and he prayers for them. Are you doing that? Are you praying for the saints in your lives? I know I'm not. I realized yesterday, thanks to Annie's post about her marriage, I don't even pray for my wife. How sad a place I'm in that I don't pray for others, not even my wife? How many times do we say, "I'll pray for you,"? Do you do it? I might say a quick prayer right after I tell someone I will pray for them, but just to make sure I'm not a liar. There's no pattern of prayer for the saints I know. It's time to change that. It's time to be passionate about fellow believers. Paul simply heard about the faith of the saints at Ephesus and he couldn't stop being thankful for them and praying for them. I'm going to start simple. I am thankful for me wife. She is a huge support and help mate. I love that Jim Galbraith term, "help mate." I remember way back before I even understood dating, let alone marriage, I heard Jim use that term in a sermon at FBC. And now that I'm married to a great woman, it makes sense. Lisa is my help mate. I need to thank God everyday, without ceasing, for Lisa. I need to thank God for all the faithful saints in my life. God provides use with help mates, leaders, examples, friends, family, supporters. And He has placed these people in our lives to show us His glory and to give us the help we need to glorify Him with our lives. His provision helps us worship Him better. Paul was thankful and prayed for the saints at Ephesus. We too should be praying for the saints in our lives. This is the first part of a video from the 1972 movie "Fear is the Key." This is part one of a sweet car chase scene. Find part 2 of this awesome car chase over here at Tech-Guy-Ted. As a believer, and someone who grew up in church, it seems like it's common knowledge that Christ died on the cross for our sins. When I heard the truth of the gospel of salvation I believed and was saved from my sins. It's hard to remember there is a majority of people out there who reject God and salvation. It becomes easy for me to think that I'm the smarter person, not remembering that it was God who called me to salvation. With that salvation, God had to seal it with the Holy Spirit. Why? Just as we wouldn't have made the choice to believe on our own, we wouldn't make the choice not to sin on our own. When left to my own decision making, all to often I choose sin over what God would have me do. Thankfully, Ephesians 1:13 tells of God's promise to seal our salvation with the Holy Spirit. Without that seal, I think the Arminians and Nazerenes, some of who believe you can lose your salvation, might have some weight to that belief. If salvation was based on our own ability to save ourselves with the good we do, we'd all be in a really bad place and headed to a worse one. Without God's calling, our selfish desires would stop us from achieving any good. I can't imagine life without God's common grace (grace shown to all mankind), let alone His saving grace. Ephesians goes on in verse 14 to tells us our inheritance is guaranteed by the Holy Spirit. He is "the guarantee of our inheritance until we acquire possession of it," or until we are in heaven with God. Without the Holy Spirit we wouldn't make the good decisions in our lives. We wouldn't think, "I'm in sin," or "I'm about to violate God's laws," and flee from that decision. Only by God's good grace are we given a helper to guide us to those right choices, all to the glory of God. Check out my story of termination and rehire here. After the recent attacks I've made on the DEWmocracy campaign going on, I felt it was important to show I'm still a loyal Pepsi-Cola, Pepsico, and most importantly Mountain Dew, fan. Here is a shot of a shelf in my pantry. And I have cold ones filling my fridge. 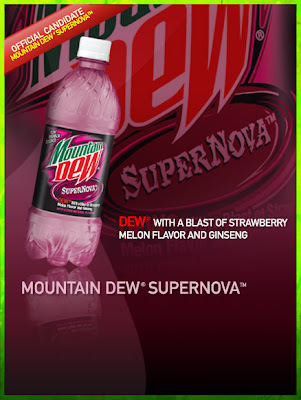 The third and final new flavor, SuperNova, is Strawberry Melon with Ginseng. It's a light purple color and taste pretty much the same was the other two. There was a strawberry soda memory I had, but I can't remember when the last time I had one was. I think I had a Strawberry Crush sometime back in the mid 80s. Anyway, this was probably the most "dew-able" of the three, but I say strike 3. Sorry Pepsi Co., this experiment did not "dew" well in my opinion. I'm still waiting for someone to realize the retro thing worked for cars, why not soda companies? Bring back the glass! Looking back to verse 5 of the first chapter of Ephesians, and comparing that to verse 11, where we are told we have "obtained an inheritance" in our predestination, I can't help but think how awesome our adoption really is. God predestined us "according to the purpose of Him who works all things according to the counsel of His will." This means, my inheritance is because God's will is best satisfied by saving me. WOW!!!! He works our all things, including my salvation, to please His will. God is glorified by calling me to Himself? His will is to save me? It's too good to be true. I'm undeserving of this gift. I can only hope to live each day better, not that I can without the power of God and the promise of the Holy Spirit. And not because it will earn me more favor or more salvation, but because I desire to please the God how saves me from these sins. Verse 12 tells me God did all this for the praise of his glory. This thought begins to blow my mind. God will be glorified by Him saving me and offering this inheritance based on His decision to call me out of sin? I only hope in Him and He saves me! Again, WOW!!! God is great! His grace is an undeserved inheritance, given without merits earned by me, before the foundation of the world. I remember my 3 main friends growing up were all really good at video games. Dan, Ryan, and Jon spent thousands of dollars on games at Auburn's Prospector Hill, playing games like Street Fighter. This video shows some clips of the newest version. UPDATE: Blog reader apps can't retrieve the video. Go here to watch it. It's fun to reminisce about the good old days. BTW Dan, can you comment on how much money you think you gave Prospector Hill for the version of Street Fighter you mastered? Yesterday, for church, Lisa and I attended the First Church of Our House, with Pastor John Piper. Yeah, we ditched church. But we still wanted to hear a sermon, so I downloaded a Piper sermon on Matthew 6:24-34. It was a great choice, considering our current situation, with my recent job loss. Jesus words are recorded in this section of scripture, which makes it seem that much more powerful. I don't know if that's true, but I love to think about God speaking directly to man. It would/will be awesome and amazing to hear the voice of God. Jesus starts by telling us, "no one can serve two masters...(not) God and money." If we serve God, we do not need to be anxious about anything else, the so called "happiness money provides". Jesus tells us this over and over in this passage. Do not be anxious. Do not be anxious. If God provides for the birds what they need for the day, how much more will He provide for our needs? Jesus says, "Are you not of more value than they?" The Son of God, God as man, tells us in this "duh" type rhetorical question that we are more important to God than the birds. The lilies of the field grow without toil, and they are beautiful. "...will He not much more clothe you...?" Being anxious doesn't add a single hour to our lives. Because Jesus said this, I tend to think He's referring to it doing the opposite. Stress takes away from our life span. We have nothing to be anxious for in this life. God knows our needs, and he will provide for them all, if we seek first His kingdom and all righteousness. And He uses the word "seek". God knows we are not going to achieve perfection in this area. But the more we seek His kingdom and His righteousness, the less we will have to stress about anything else. If we look for happiness in food and clothing, we are just like non-believers. We will be anxious about where we can gain more food and clothing. We will begin worrying about tomorrow's food and clothing, and tomorrow's happiness. Our God is great! As we seek Him, He lavishes grace on us, He provides for our needs, He releases our anxieties, He gives us joy. As we seek God, He draws closer to us. There is nothing to be anxious about. God blesses the lives of His believers, providing for all our needs. Friends, I've discovered a way to add MP3 files to my blog. It's neat. 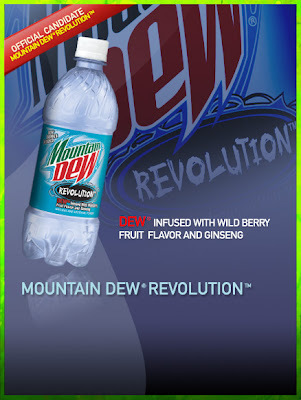 The second of the three new flavors, Revolution, is Wild Berry Fruit with Ginseng. It too is a blue/purple color. And, it too tastes no good. There is a berry flavor, but did they forget to wash the berries? Again, I gave this flavor the same 3 chances as Voltage, out of a plastic bottle, over ice, and with Triscuits and string cheese. And while it's not as bad as Voltage, it's not a going to be a repurchase either. The bad after taste earns this one a "foul tip". Strike 2. One more flavor to go.